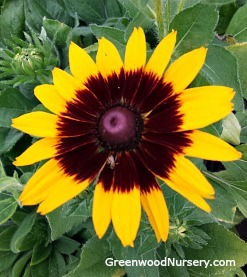 Denver Daisy Rudbeckia is a favorite summer flowering perennial plant. This black eyed susan was developed for the 150th anniversary of the city of Denver. This garden perennial plant has heat tolerant blooms that bright yellow with brown centers. The Denver Daisy Rudbeckia attracts butterflies all summer long. Divide your Denver Daisy clumps every 3 years to keep plants looking neat.